Everybody notices Brazil’s amazing growth in world economy and its rapid ascendance in the poker world. 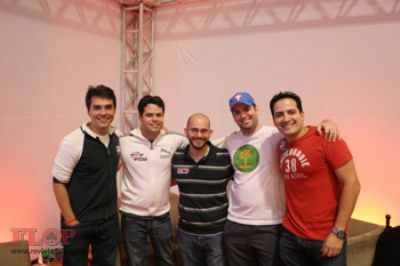 It has been less than five years since poker first took hold in Brazil and, at its core, were the pioneers who are part of Team Brazil, led by the Captain Juliano Maesano. In only a few years Brazilian players have garnered substantial online winnings and already conquered a bracelet at the World Series of Poker (“WSOP”), three WSOP final tables and one World Poker Tour (“WPT”) title. WORLD TEAM POKER EVENT @ GOLDEN NUGGET HOTEL & CASINO. LAS VEGAS, MAY 19TH, 2010. Once an anomaly, today it would not be surprising to find oneself sitting at a poker table and notice one or more Brazilian opponents. Brazilians are a passionate people: they are passionate about soccer, passionate about mixed martial arts, passionate about having the Olympics, and now they are passionate about poker! Poker has become the newest Brazilian obsession and as a result, thousands of people are playing every day – and thousands more are cheering for their country mates at the online chatrooms and/or live rails. While one might expect to see the exuberant Brazilians waiving their banners at team sports like soccer and volleyball, don’t fool yourself in believing that Brazilians are apathetic towards poker but just because it is an individual sport. The Brazilian people are united and are always there to cheer and support their fellow countrymen, no matter what the event. The Brazilian fans drive the opponents crazy and some of them jealous they don’t share the same support from their fans. This is the Brazilian way and, as a result, both competitor and spectators arrive to poker competitions strong and motivated to face the best players in the world. “Team Brazil comes to the Golden Nugget to show everyone how well we can play and that we always should have a place in any international poker event. Poker is rising fast in the Brazilians list of favorite sports and entertainment activities, and you can be sure we will populate the top players lists in the years to come. We are very happy and proud to challenge the top players in the world – who will battle with us armed with dozens of bracelets. One of our goals is to bring joy and entertainment to the event. The other one – is to win. And we will”. Team Captain Juliano Maesano is known by every poker player and enthusiast in his country as a pioneer for poker in Brazil. Maesano created Flop, the largest and most important poker magazine in his native Brazil, and the subsequent Flop Awards – having hundreds of nominees and awarding poker players and professionals in more than 20 categories every year. He also founded the Brazilian Tournament Director’s Association (ADTP) and has also been a television commentator for poker broadcasts. Juliano excels at mixed games, leading Brazil’s national H.O.R.S.E. ranking and was voted by his peers as the Best Mixed Games Player in 2008. Dedicating a lot more time for his work and acceptance of poker by the Brazilian society and government, his best international result was a 10th place finish at the 2007 WSOP S.H.O.E. event. Christian Kruel is the real pioneer of Brazilian poker. Along with his friend Raul Oliveira, Kruel studied Economics and moved from backgammon to poker after watching the movie “Rounders,” and both started learning the game in the boom of Limit Hold’em, as this was the game of choice around the year 2000. His live results include 4 WSOP cashes, an 8th place at the WPT 2005 Caribbean Adventure and a 3rd place at the biggest Latin American event, the Conrad Poker Tour Main Event, in 2008. Leandro “Brasa” Pimentel was first at many Brazilian poker achievements: the first Sao Paulo State champion in 2005, first Brazilian champion in 2006, first heads-up champion in 2008, first Brazilian to acquire an online Triple Crown from Pocket Fives, first Brazilian to win a Full Tilt Poker Million tournament and, most importantly, he was the first Brazilian to ever reach a final table at the WSOP, in 2007, when he finished 4th in Event 49, a record-breaker with 3,151 players. His latest live result was finishing 2nd place at the Full Tilt Poker Latin American Heads-Up Series, in Argentina - a show aired in ESPN Latin America. Rodrigo “Zidane” Caprioli is better known by the Brazilian players who started it all years ago, when he was very active in the live Brazilian scene. Since then, Caprioli focused on playing online – mostly PLO cash game and sit-and-gos. This past year he won one Brazilian Series of Poker title and had great results like a 16th place at the EPT London, a 17th place at the LAPT Mar del Plata and a 23rd finish at the 10K PLO WSOP event. Felipe “Mojave” Ramos is an all-around player having great results both live and online, with a little over than $1 Million in tournament prizes in his short professional carrier that started in Jan`08. Mojave made the final table in last year 5K PLO at the WSOP and is also a regular live cash game player, where he plans to specialize more. His ability to change gears and styles and the way he trusts in his instincts is what surprises his opponents the most. Come to meet the players and stay for the party. The Gold Diggers Night Club is The Golden Nugget’s hottest new spot for cocktails, DJ and great balcony views overlooking the Fremont Street Experience. Wednesday, May 19, 2010, 12:00 p.m. The Grand is an 11,000 square foot event center located right off the casino floor. The filmed for television event will be a five table shoot out format consisting of rounds of Limit Hold’Em, Pot Limit Omaha and No Limit Hold’Em. The last two players from each shoot will compete in a final-table showdown. Team Captains can make substitutions throughout the event, allowing for a level of team strategy previously unseen in poker as the Captains attempt to find the perfect matchups and place experts in different games on the felt for their respective specialties. Wednesday, May 19, 2010, 10:00 a.m. Team USA and Team Full Tilt Pro Mike Matusow will be signing his book “Check Raising the Devil” between 10:00 a.m. – 11:00 a.m. on May 19, immediately before the event kicks off. World Team Poker features a unique concept of team poker with the thrill of international competition between top professional poker players from countries throughout the world battling it out for “Pride, Passion, Country.” World Team Poker’s season will culminate in a World Team Poker Championship Event in the tradition of the Super Bowl, Olympic games, or FIFA World Cup, where the teams will compete for the ultimate title: World Team Poker Champions!